Patented, mildew-resistant DuPontmaterial is designed to meet cleanroom (Class 1000) applications for lint reduction. Ideal for cleanup of food service areas, hospitals, and oil and hazardous chemical spills. 100% recycled, cotton/synthetic blend fibers are interlocked for strength, less linting and launderability. Fibertac process Cut end mops last three times longer than comparable Cut end mops. Durable double-sewn tailband. 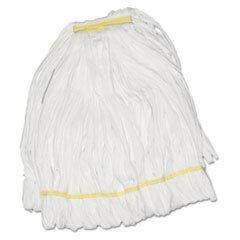 Narrow 11/4 canvas tape headband works with clamp style mop handles (sold separately). Patented, mildew-resistant DuPont material is designed to meet clean room (Class 1000) applications for lint reduction. Ideal for cleanup of foodservice areas, hospitals and oil and hazardous chemical spills. 100% recycled, cotton/synthetic blend fibers are interlocked for strength, launderability and less linting.